Peraves CEO Roger Riedener assembled another beautiful MonoTracer calendar for the 2013 model year with some of the best photos from the past few years of MonoTracering adventures. Photographers include Friedemann Lätsch, Dan Lexa, Roger Riedener, Stefano Paris, Markus Jann, Roland Briel, Michaela Moser, and Alain Brideson/Designwerk. I’ve parsed the calendar into JPEGs viewable below. Click the jump if you’re viewing this from the main blog feed to see each JPEG individually. A low resolution (3.1Mb) PDF version of the 2013 MonoTracer of Switzerland Calendar is available by clicking here. January 2013 MonoTracer of Switzerland Calendar – Swiss customer having all the fun with his white MonoTracer. There are still 10cm of air under the retract, Reto! 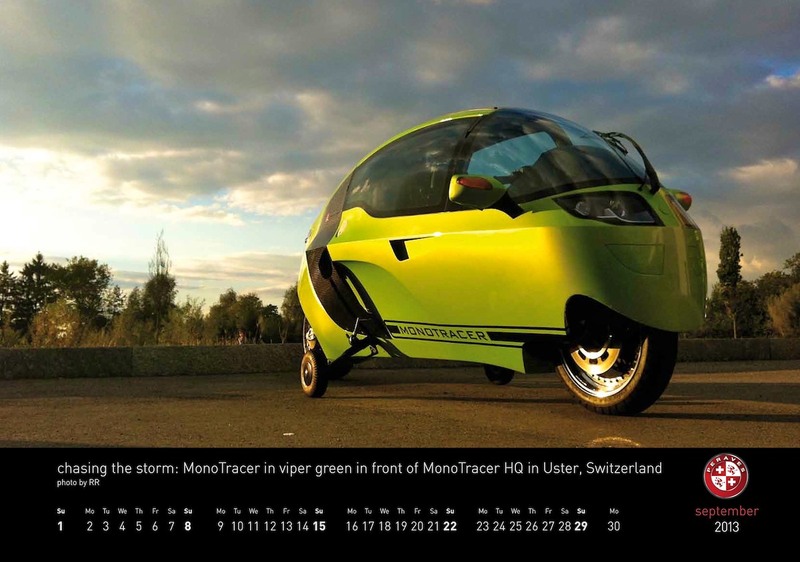 February 2013 MonoTracer of Switzerland Calendar – 1320 Nm of torque at the back wheel takes some serious rubber. 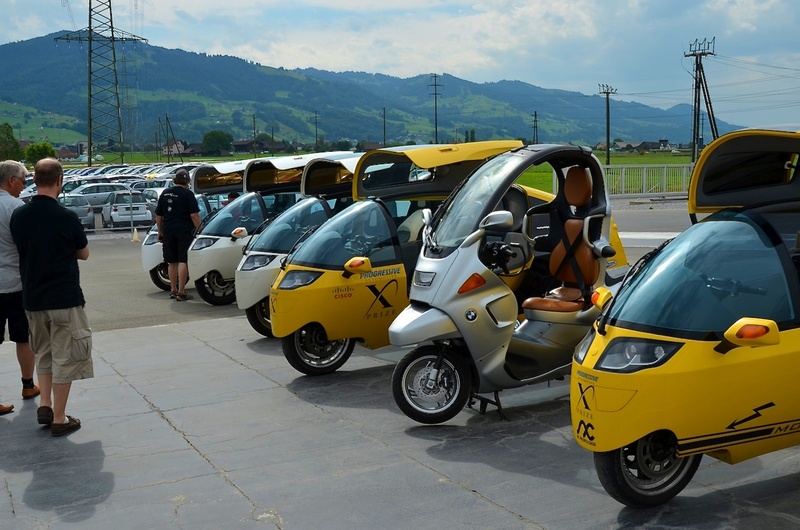 over 300 km of range on a single charge at 100 kph constant speed! March 2013 MonoTracer of Switzerland Calendar – Aleksandra, italian beauty working at Museo Ferrari in Maranello, takes a break to check out rosso corsa red MTI-1200. 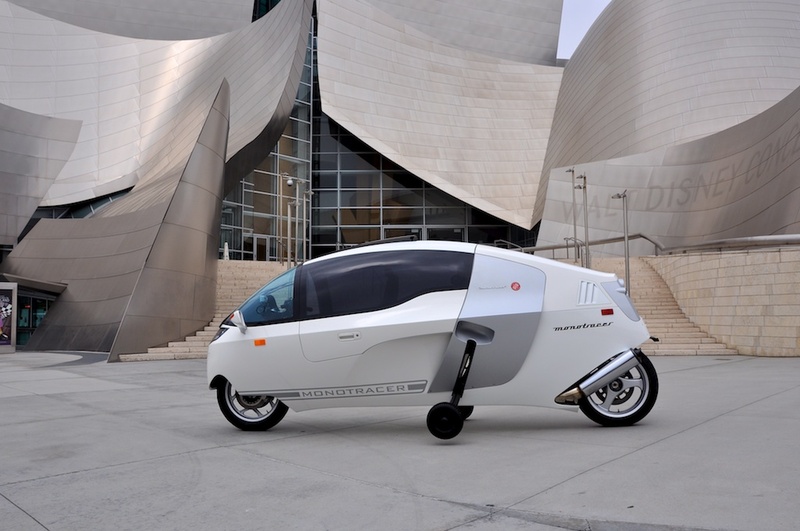 April 2013 MonoTracer of Switzerland Calendar – carrara white MonoTracer MTI-1200 BMW in front of Walt Disney Concert Hall in Los Angeles. 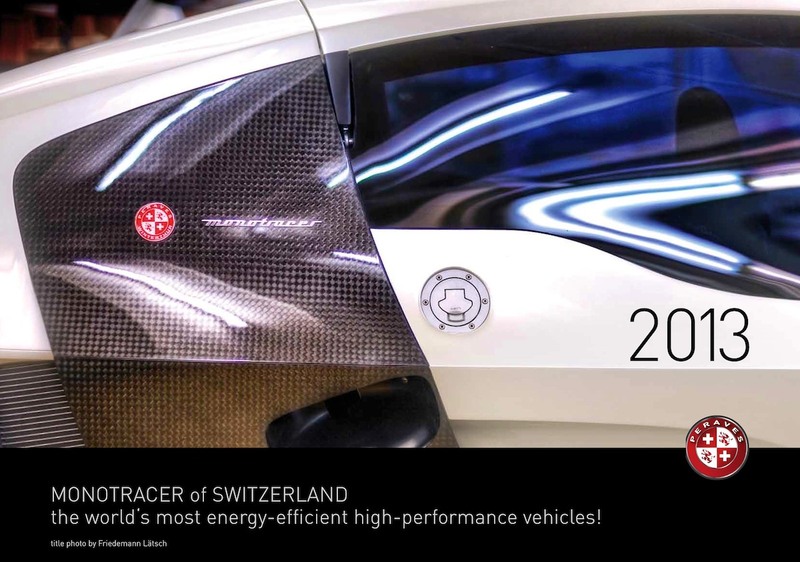 May 2013 MonoTracer of Switzerland Calendar – and from time to time, graceful creatures appear and enlighten our souls at boring car shows. June 2013 MonoTracer of Switzerland Calendar – Attention: high voltage! the MTE-150 soars silently underneath power lines near Brno/CZ racetrack. July 2013 MonoTracer of Switzerland Calendar – fine riding style with perfect head position demonstrated on track by Paul Blezard! pureblue MTI-1200. August 2013 MonoTracer of Switzerland Calendar – electromagnetic tests at the VDE lab in Offenbach, Germany, for ECE-R10 certification. September 2013 MonoTracer of Switzerland Calendar – chasing the storm: MonoTracer in viper green in front of MonoTracer HQ in Uster, Switzerland. October 2013 MonoTracer of Switzerland Calendar – tornado red electric MTE-150 glides across Danube University Krems campus in Austria. November 2013 MonoTracer of Switzerland Calendar – the past: Mauser Einspurauto / “La Monotrace” from 1928, seen at Technikmuseum Sinsheim, Germany. Many who see a MonoTracer for their first time have asked “Are you from the Future?” One instagram photo captured by lilcflo has a caption which reads: “Welcome to the future folks! 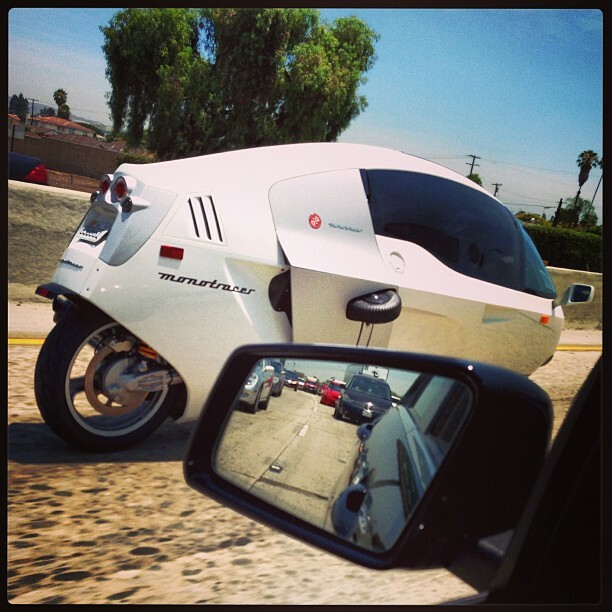 !” Another instagram by popstar_mini exclaims: “I don’t mean to alarm you, but George Jetson is on the 5 Southbound Freeway.” In reality the concept of the cabin motorcycle is almost a century old. 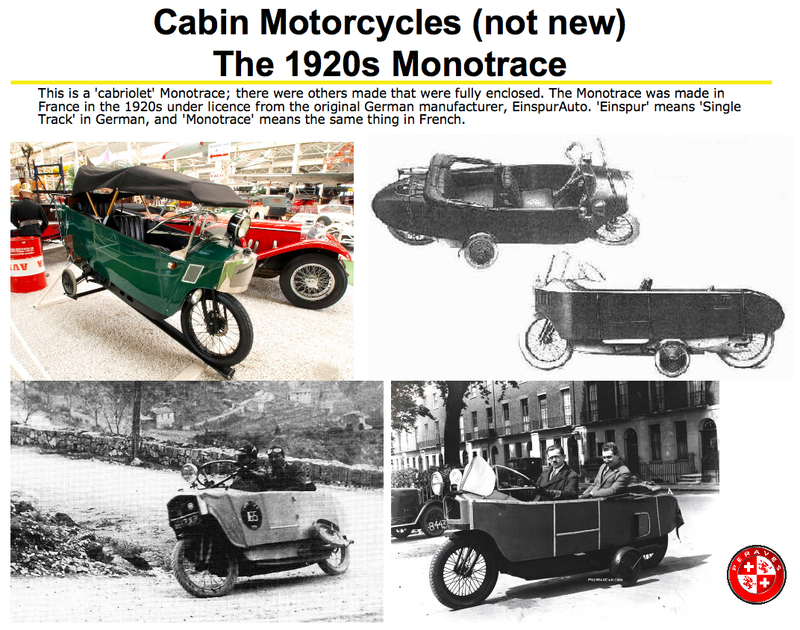 One of the first cabin motorcycles debuted in the 1920s and was called the Monotrace. The Monotrace was a cabriolet and was manufactured in France in the 1920s under licence from the original German manufacturer, EinspurAuto. ‘Einspur’ means ‘SingleTrack’ in German, and ‘Monotrace’ means the same in French. 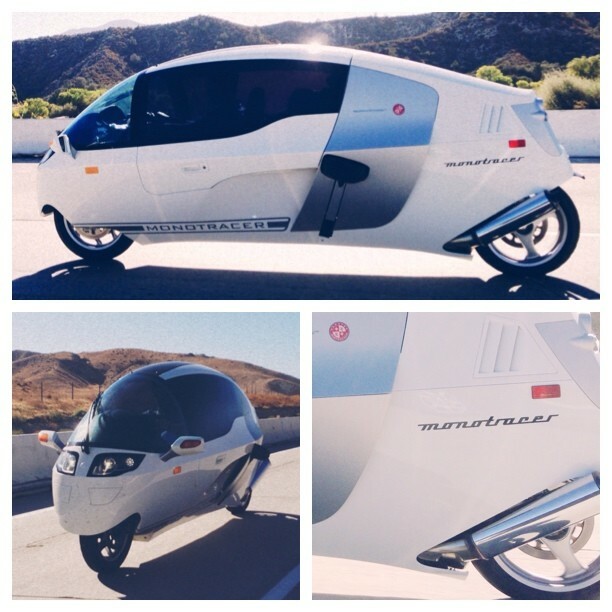 Instagram by lilcflo – Welcome to the future folks!! 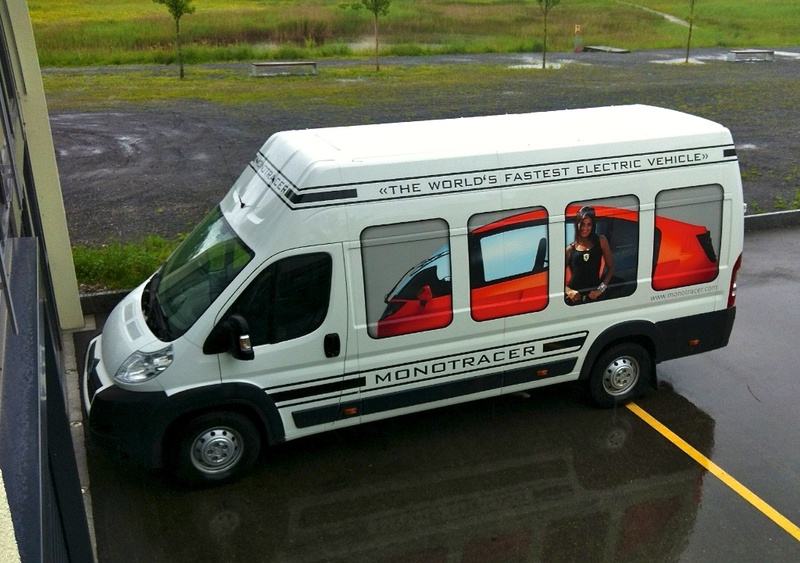 The Mono Tracer. Was in shock to finally see one on the road! In the 1930s a group of cabin motorcycles began to appear in eastern Europe called Dalniks – a sensible hybrid of an automobile and motorcycle. The idea was to do more with less. A half-sized car with only 2 main wheels was more affordable, used less materials to build, and was more efficient and thrifty on precious fuel. All of these traits were important before and after WWII. Jan Anderlé’s Dalniks from the 1940s. 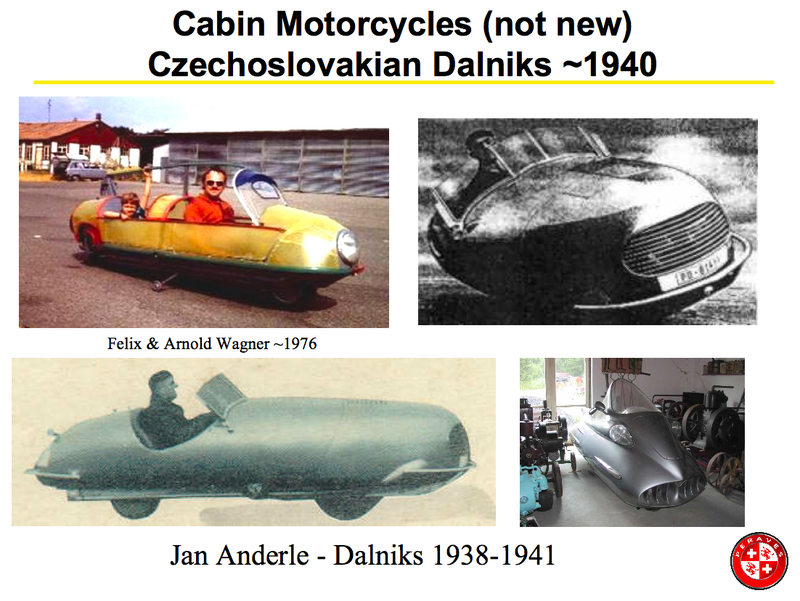 The recognized “father” of the Dalniks was Jan Anderlé, a brilliant Czech aeronautical engineer. He began designing and building cabin motorcycles in the 1930s. His innovative outrigger wheel system kept the vehicle upright when stopped. Below is a brief “silent video” of Jan Anderlé’s 1941 Dalnik (with soundtrack added). Jan demonstrates the controls, the outrigger stability system, starts the engine, goes for a drive showing how it cruised quickly and effortlessly, picking up his wife for a date at the end. The Future: MonoTracer MTI-1200 at Walt Disney Concert Hall in Los Angeles. At the end of August 2012 I spent a Saturday with a film crew from the Brazilian AutoEsporte TV show piloting and shooting the MonoTracer MTI-1200 all around Southern California. I met up with the producer Tiago, host Diego, and cameraman Alcides in the morning in Anaheim. From there we traveled via freeway to the Walt Disney Concert Hall for some beauty shots. We then headed to Griffith Park for some green scenery. Finally we drove out to Santa Monica and up PCH towards Malibu for some ocean and beach shots. Here is the edited AutoEsporte MonoTracer MTI-1200 video review that aired last Sunday in Brazil. 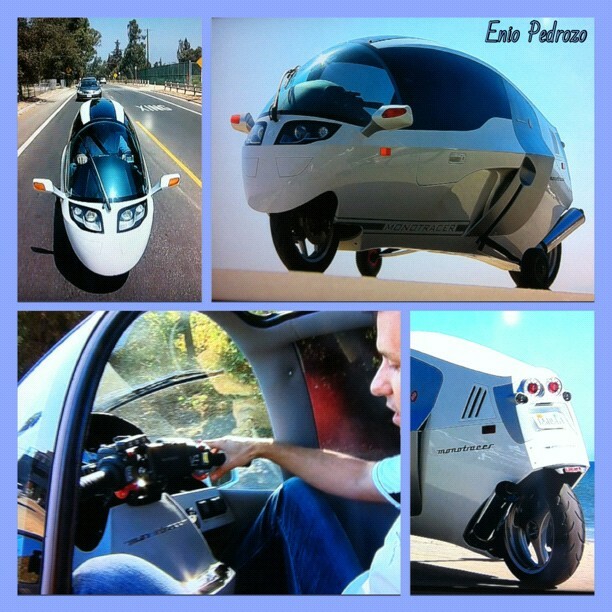 MonoTracer mistura moto, carro e avião e é destaque do filme “O vingador do futuro”. 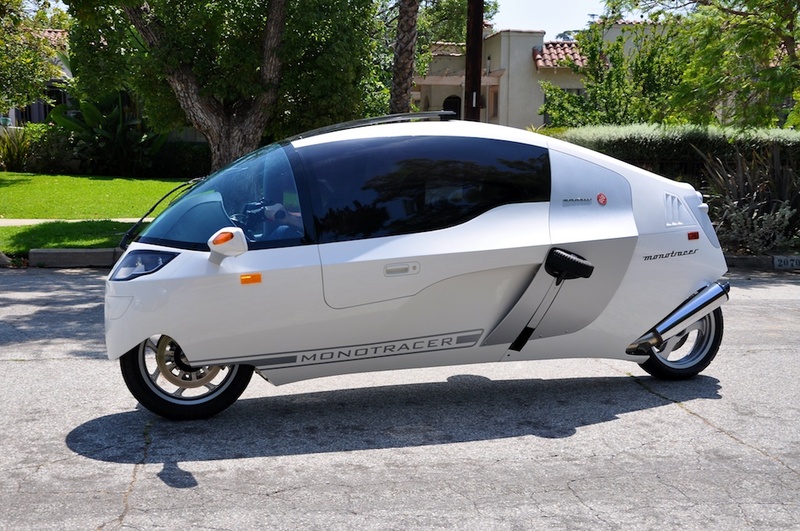 Translation: MonoTracer is a mixture of motorcycle, car, and plane and is featured in the 2012 movie “Total Recall”. Anytime you’re out with a MonoTracer everyone becomes a paparazzi and photographs the vehicle with their cellphone. 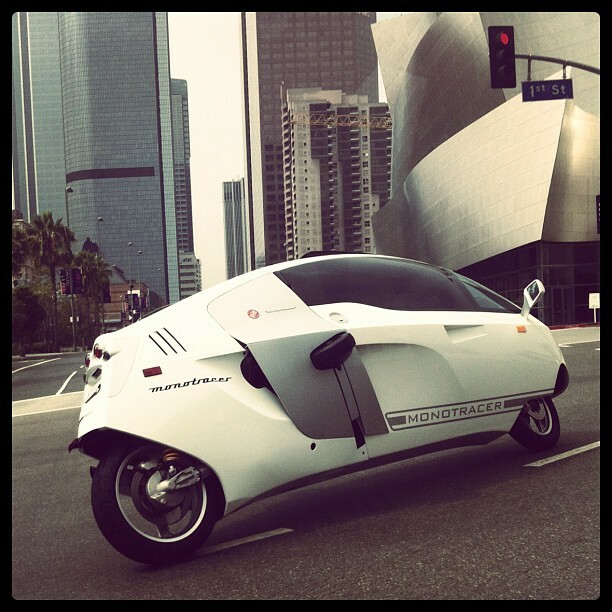 I ran across this very sweet Instagram photo of the MonoTracer banking left on to South Grand Avenue in front of the Walt Disney Concert Hall taken by Michelle Kim. You can watch this maneuver and her snapping the photo if you look closely in the AutoEsporte MonoTracer MTI-1200 video segment above. 2012.08.25 – MonoTracer MTI-1200 banking left on to South Grand Avenue in front of Walt Disney Concert Hall. Instagram photo by Michelle Kim. 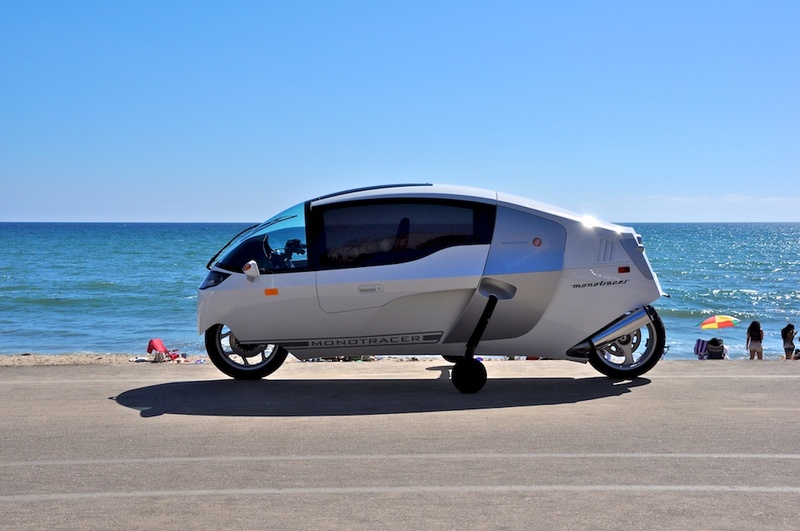 MonoTracer MTI-1200 parked beachside along PCH close to Malibu, California. 2012.08.24 – Trainees,Trainers, and Trainulators at the Third MonoTracer Training of 2012 in Tuggen, Switzerland. 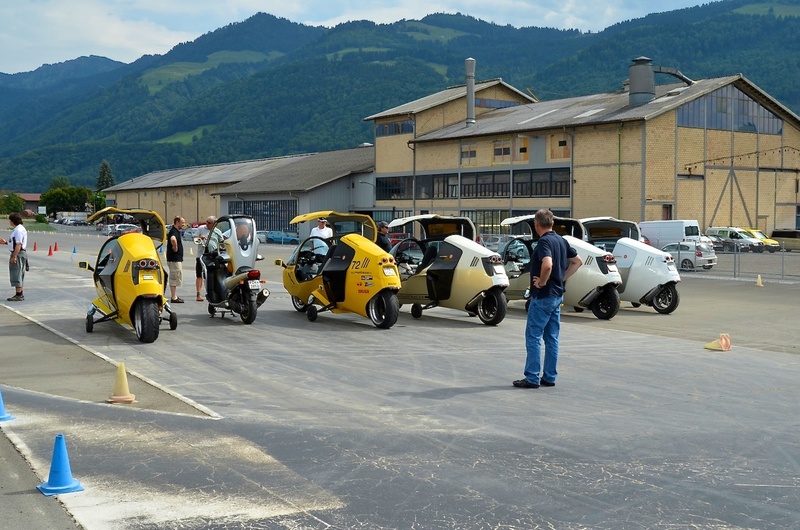 Last week Peraves held the third MonoTracer training of 2012 again in Tuggen, Switzerland. 10 newbies attended along with Ruedi Steck and Michael Kutschke. 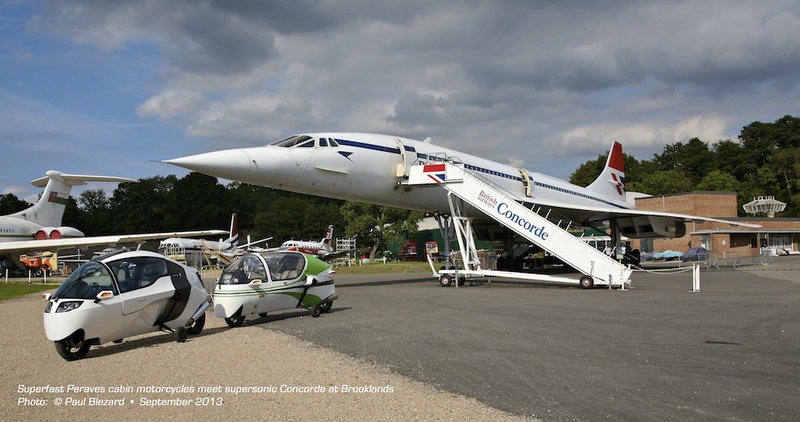 Ruedi Steck of Swiss Performance is a Bonneville world speed record holder and will be piloting the X-PRIZE winning all electric X-Tracer7009 to 200mph in spring 2013 at the Nardò Ring high speed test track in Italy (recently purchased by Porsche). Michael Kutschke is chief editor of Töff Magazine and will be covering the whole Nardo story. 2012.08.24 – MonoTracer Trainulators at the Third MonoTracer Training of 2012 in Tuggen, Switzerland. The fourth and final MonoTracer Training day for 2012 will be held on Friday, October 12th in Tuggen, Switzerland. Contact Peraves if you would like to attend.